Having clean makeup brushes is important! 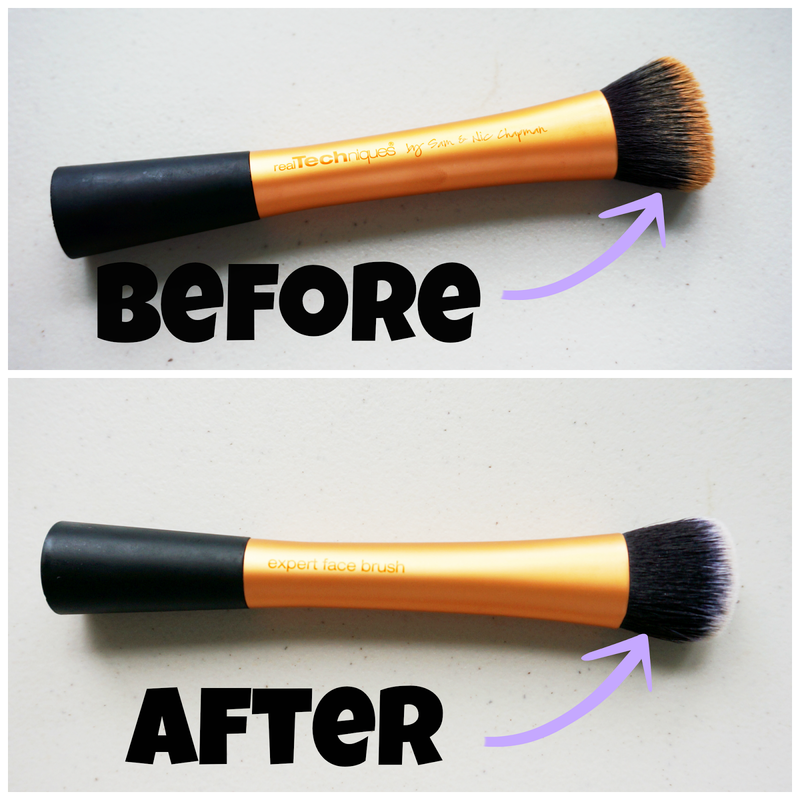 Not only do clean brushes help with makeup application, but it also prevents acne breakouts. Thousands of microscopic bacteria can get stuck in between the bristles of your makeup brushes when they are not clean. When you use the brushes without washing, you are basically dipping a bunch of bacteria on to your skin then contaminating the rest of your makeup when you place it into another product. A common bacteria that you can find in your brushes is Propionibacterium acnes. This is what Propionibacterium acnes looks like. It may sound familiar to you because it is known as the bacteria that causes acne (hence the name "acnes"). When you don't wash your makeup brushes, these tiny microscopic bacteria can be found hiding inside your bristles. Seems harmless right? No not at all! P. acnes is known as an "opportunistic bacteria", meaning that it seems harmless at first, but can cause severe infections from other bacteria. Of course, you may be wondering: "How do you know this?" I've taken a course in Microbiology, which focuses on bacteria. BUT you don't need to have taken a Microbiology course to know that there is bacteria in makeup brushes. Use some common sense and know that it is important to wash your makeup brushes! 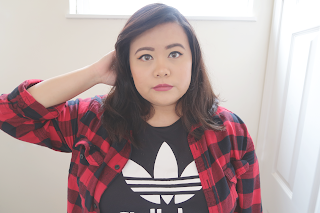 I was inspired to make this post because I suffered from severe acne breakouts recently. At first I was thinking it was all hormonal. I blamed Aunt Flow for making her monthly visit, but I was wrong. I took a look at my makeup brushes and what I found SHOCKED me. 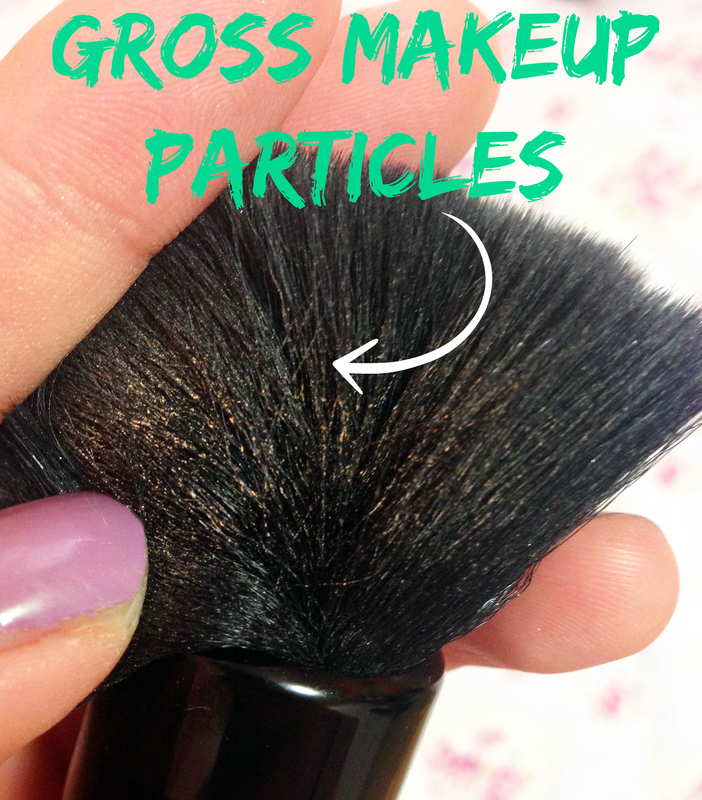 I had gross makeup particles stuck inside my foundation brush! I felt like vomiting. Just image the amount of bacteria trapped inside this dirty brush. 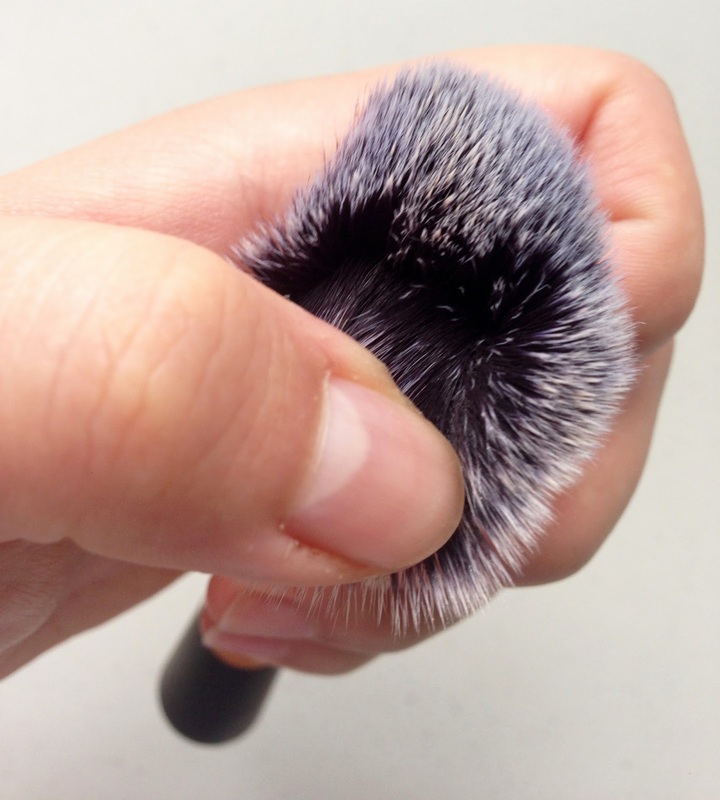 After seeing this, I immediately decided to wash all of my brushes. I'm not going to lie to you guys. I find myself on a lazy streak sometimes, but I thought I was taking pretty good care of my makeup brushes. It wasn't until I started breaking out on the regular that I found out I wasn't doing a good job washing my brushes. I used to wash my makeup brushes every 2-3 weeks. (Please don't judge me, I know that it's really gross!) I'm just going to own up to it and say that I was being lazy. I had no excuse. "I vow to wash my makeup brushes every week from now on!" 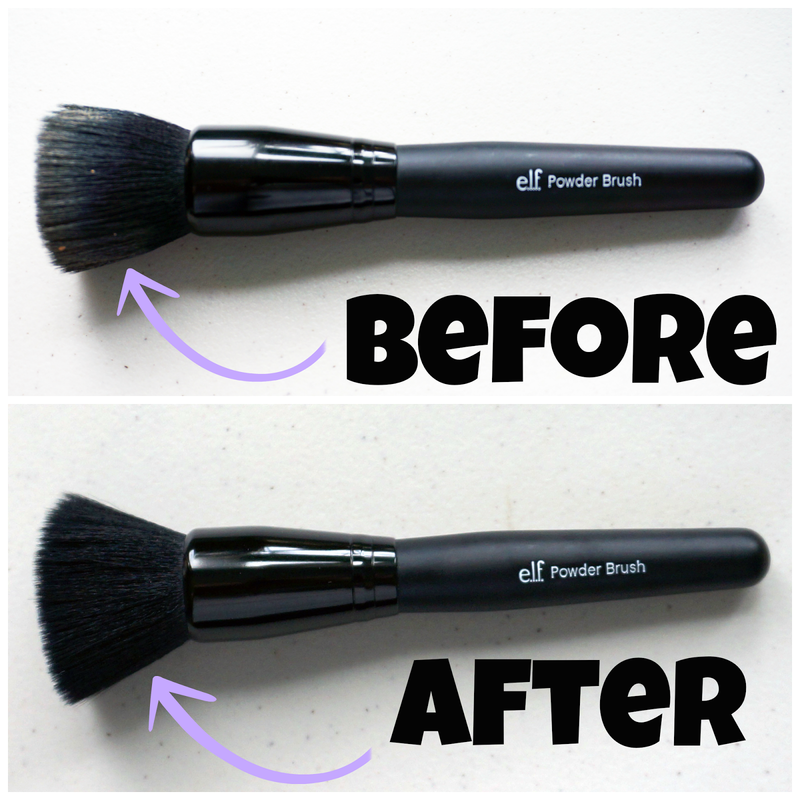 I currently use the Elf Powder Brush as my foundation brush. You can find it for $3 at Target! It's a great brush, but I find that the bristles aren't packed tightly together. It's easy for your makeup products to seep in through the middle of the brush and trap unwanted bacteria. Also when you wash it, some of the synthetic bristles will fall out! But for three dollars, you really can't complain too much. I swear I didn't buy a whole new brush! The bottom photo is after I finished washing it. After finding those gross particles, I washed my brush super throughly! I spread apart the center and intensely scrubbed the bristles until there were no more particles. Look how clean it is! See? No more gross particles stuck in the center! The way I wash my makeup brushes differs a bit. No one has ever told me the "right or wrong way" of washing my brushes so I came up with my own way. I usually just wash my brushes using shampoo along with a couple of sprays of Sonia Kashuk's Brush and Sponge Cleaner. I find that using shampoo on my makeup brushes makes them shinier and gives them a good scent when they dry :)! The Sonia Kashuk brush cleaner just isn't ideal to use by itself. I found that it barely takes away the foundation that I use. I mainly just use it to disinfect the brushes. 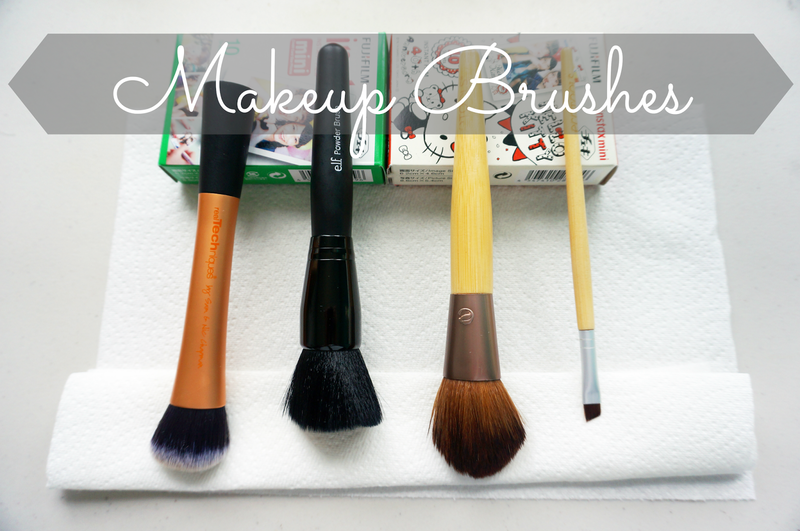 Speaking of brushes, I recently decided to get serious about my makeup brushes! I bought a Real Techniques brush set from Amazon. I already had their foundation brush before and really liked it so I decided to buy the entire set! 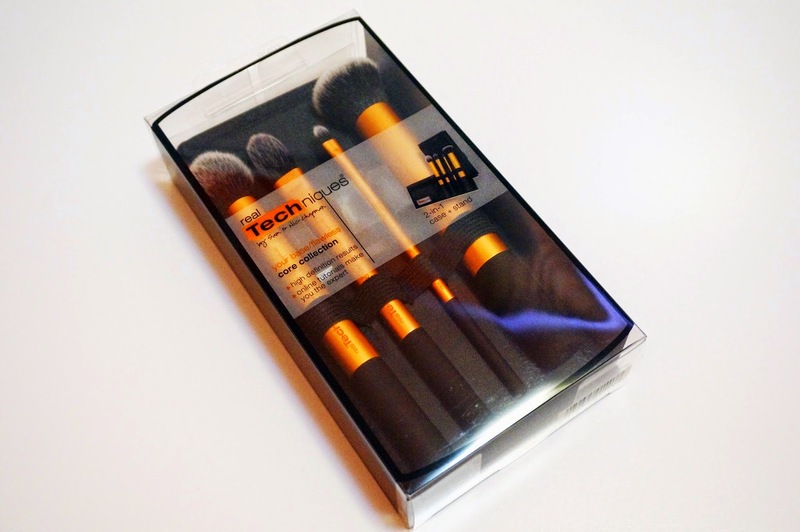 Many of my favorite Youtube beauty guru's use Real Technique's brushes so I decided to give their set a try myself. 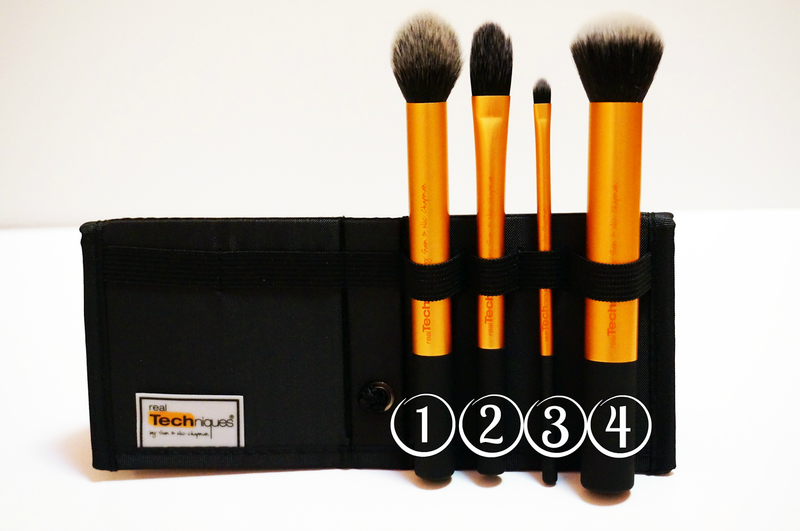 This set comes with four makeup brushes. For $13 this makeup brush set definitely feels worth it! The bristles are super soft and the brush feels like it's built to last. In the Amazon description, it claims: "...bristles are non-porous and do not trap or absorb product, bacteria and dead skin cells." I hope it lives up to this claim! I have not used all the brushes so I won't be writing a review on it yet. However in the future, I plan on writing a review on all the brushes so look forward to that! Since I had their Buffing Brush / Foundation Brush from before, I tested it out of a week to see how well it cleans out. I like that the top of the brush is white! The white color indicates how clean your makeup brush is. The whiter the better! I keep challenging myself to wash the brush until the tops come out looking brand new! As you can see, this is what the bristles looked like before I washed it. There's a bunch of foundation packed on the brush. After washing, you can see that the brush went back to its normal white color and there isn't any foundation hiding in the center of the brush. I guess it's safe to say that the Real Techniques brush lives up to its claim about not trapping bacteria! 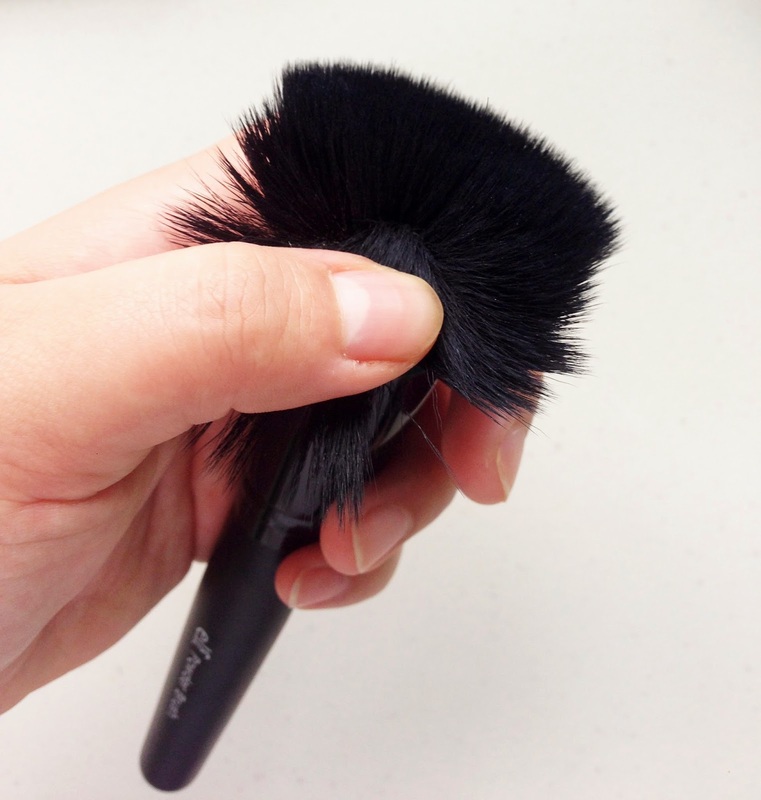 No matter what kind of makeup brushes you use, it's always important to keep them clean! 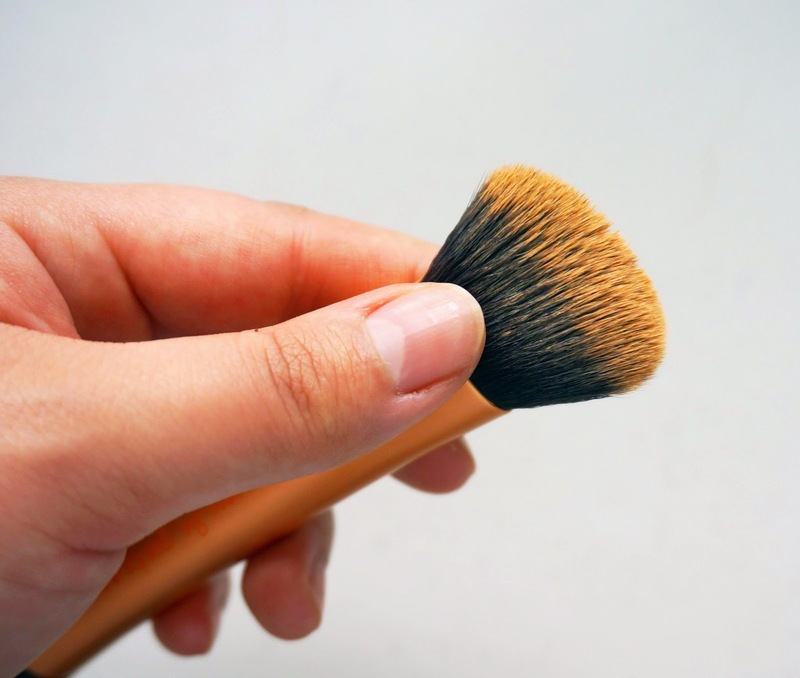 You don't have to be a microbiologist to know that dirty makeup brushes can trap bacteria that causes acne. So be safe and clean and remember to give your brushes a good and through wash!